Tape in hair extensions are the second most popular hair extensions application at Christina White Salon just behind fusion hair extensions. Christina White Salon has been applying tape in hair extensions for years and they are the easiest to install. It involves sandwiching sections of the natural hair between two hair extension wefts. 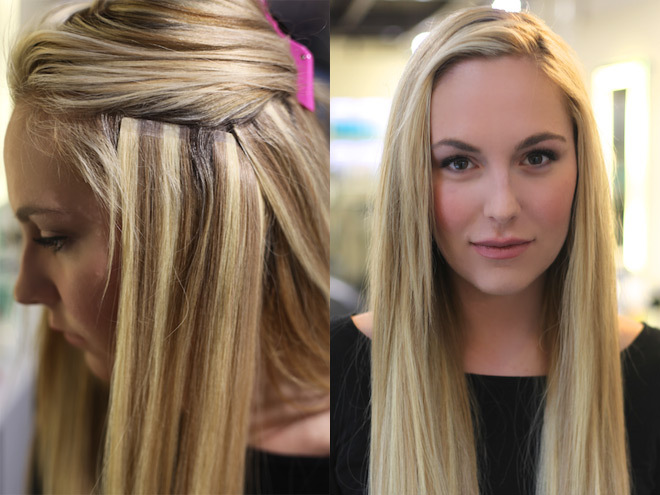 The benefit of tape in extensions include a lower up front price point than fusion extensions. And, they can be reused for up to 3 times. After 4-6 weeks Christina White Salon will take the tape in extensions out, wash your hair, replace the tape, and install them back into your hair. If you are interested in tape in hair extensions call us now for a free, no obligation quote at 314-380-4508. Tape in hair extensions come in pairs of wefts or some call sandwiches. The wefts are about 1 1/2 inches wide and are attached to the hair using medical grade tape. How Many Tape In Hair Extensions Do You Need For A Full Head? It depends on what look you are trying to achieve. Tape in extensions come in packs of 4-10 each depending on the brand. Its important to get a free hair extension consultation from us to determine how many tape in extensions you will need to achieve your goals. Tape in hair Extensions last six to eight weeks. At that time you will need to come in and have them moved up. The move up process consists of us taking them out, washing your hair, and then reinstalling the hair with new tape. Can Tape In Hair Extensions Be Reused? Yes! They can be reused six months to a year before purchasing another set. Christina White Salon Stylists are all certified in many types of tape in hair extensions. We carry our own brand called Christina White and others including Hairdreams, SoCap, Aqua, and Donna Bella. What brand you choose depends on the color, length, texture of your hair, and your price point. Why people love this method: They can be installed in as little as 30 minutes. Smooth and seamless, and super comfortable. Tape-In is great for fine and thin hair.